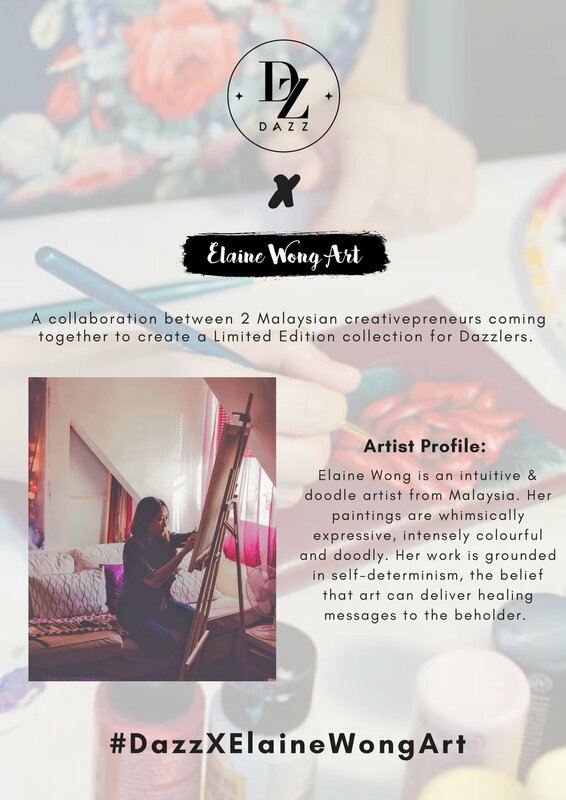 Dazz, a Malaysian fashion label, under Baby Be Dazzled was established in 2010 by founder Nicole Chua. 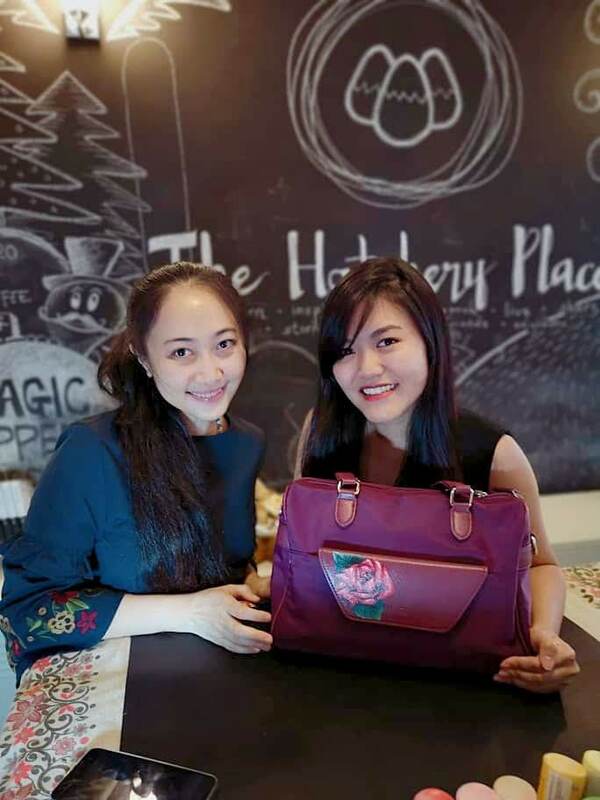 The company has a vision to spark creativity and individualism among women through style at affordable prices DAZZ offers uniquely curated selection of women’s fashion pieces – bags, wallets and accessories – to suit every outfit and occasion alike. In September 2018, Nicole contacted me to brainstorm on the idea of a collaboration. I jumped in delight upon the idea, as I know what the brand stands for, and I am all for making art that celebrates women and feminine empowerment. Nicole, in her eagerness to deliver remarkable timeless pieces, and me in my passion to paint on different forms of canvases were bind by the unique string of art that resulted with Art on a Bag. A handbag is another canvas where one can express ones' individuality. Bag tags and accessories could also personalize the bag but a painting can tell a deeper and powerful story of a person's character or can be a solid reminder of your persona as you relate to it. There is just you, the art, and your story. Thus, this limited edition is Dazz's way to celebrate art, individuality, and powerful stories. DazzXElaineWongArt presents you the Red Rose in honour of women's courage, enduring passion and wisdom. This specific piece of art embodies what a woman is and should be - courageous, vibrant, passionate in her own journey, we call life. 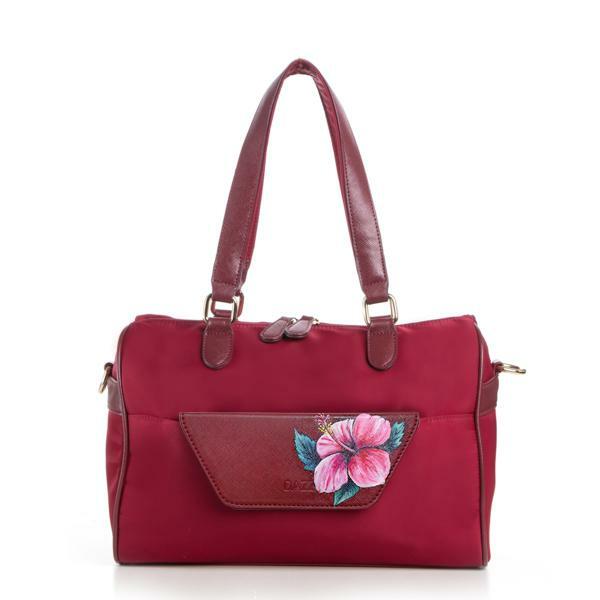 Majestic Magenta from Dazz’s Classic 4-in-1 Collection was picked as the first bag. The colour symbolizes universal harmony & emotional balance and is a perfect combination with the red rose. This Limited Edition On The Go Classic is one of a kind and carefully hand painted by Malaysian artist, Elaine Wong with much attention to detail. This Red Rose is a perfect reminder to every girl that she could slay everything that comes along her way as she juggles her role in whatever field she chooses. As my art friend & visitor of my website, I am proud to offer you a special 20% discount if you order this hand-painted bag through my link here. DazzXElaineWongArt proudly presents the Pink “Bunga Raya” or the Hibiscus. Delicately beautiful, fragile but brave - this wonder signifies the essence of a woman. How this delectable flower could be grandiose, is like a woman’s ability to be fearless amidst depravity. Hibiscus is also my country Malaysia’s national flower! This Limited Edition On The Go Classic is one of a kind and carefully handpainted by Malaysian artist, Elaine Wong with much attention to detail. This Bunga Raya is a perfect statement that she is beautiful, that even when she is delicate, she is zesty enough to conquer all. Pink on Red. Blazing with energy (red), while in balance (pink), the Pink Hibiscus and the On The Go Classic in Lipstick Red complements the feminine energy. While it is naturally delicate, the grandiose bloom of a hibiscus signifies resilience and bravery in adversity. Giving this gorgeous bag as a gift to any lady, regardless of relationship is a perfect statement that she is beautiful; that even when she is delicate, she is zesty enough to conquer all and that she is worthy of your praise and adoration. I am proud to offer you a special 20% discount if you order this hand-painted pink hibiscus on the go bag through my link here. When the Pansies bloom together, they create a magnificent scenery; which is enchanting to the eyes, and creates calmness and peace. These blooms, symbolizes freedom and vibrates positivity. A trinket that the beauty of a woman lies in her wisdom and calmness. That when she radiates her positivity, like the sea of pansies that emanates calmness, she too could be a better influence to her fellow women. And together they can create meaningful change that would impact other “pansies” and other “blooms”. A perfect picture of power in togetherness. This piece of art is a perfect gift to that person saying “Together, we can make a difference”. To grab this Limited Edition beautiful bag at 20% off, click here to pre-order yours! Behind the scenes - How I filmed myself painting the time lapsed videos.